Orchid Diamond Polishing Works Co.,Ltd. Orchid diamond polishing works ltd. (odpw) was opened in 1988 following the decision to establish a low cost, high quality diamond factory. 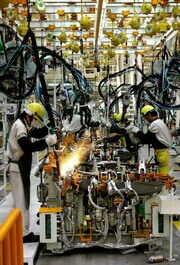 The factory was established with the permission of the Thai Board Of Investment (boi). Boi granted odpw certain privileges such as income tax exemption and import tax exemption for all machinery and tools. In return, odpw had to export all of its production. The Thai workforce was trained by a team of Belgian experts to polish a make matching that of Russian goods. The Thai workers were good learners and, by 1992, only 3 foreign experts were still needed thus reducing costs without sacrificing quality. Originally, the production at odpw consisted of Polished -11 sieve size and smaller. Beginning in 1992, 1/10 polished and 1/6 polished production was shifted from Belgium to odpw by 1995, the workforce was proficient enough to work on 1/5 polished and 1/4 followed in the next year. This process was achieved quite smoothly because it was done over a four year period; The best, most experienced polishers out of the 700 workers were chosen to make the larger, more expensive goods. Neither make nor yield had to be sacrificed in transferring the production of these larger sizes to Thailand. Orchid Diamond polishing works at full strength with 700 employees working in an extremely modern diamond factory.